I LOVE this little guy. He was so adorable perched there. All in all, I'm liking this... so I'm hoping for a 6+ score. The little fellow was set free beside the pond. Life is good. *sigh* I like the text overlapping the photo, since it's in a non-essential area. Is this an Iris? What an incredibly beautiful flower! I love the faces of your models - they always crack me up. Congrats on a great finish! well done and of course he is quite adorable! Shucks, just one shy of that little star next to your shot. Still really good though! Well done Lydia! Congrats on the high finish. Technically well done. I like the different colors in the image. Good photo just wish the text was not overlapping it. Takes away from the feel of a poster and draws my eyes away from the frog to quickly to see what's going on with the text. I wish I'd seen this before entering. Real great. This is a wonderful photo. The text looks a little jumbled together, but that's my only nit-pick. Fantastic detail and color scheme. One of my top 2 picks. Excellent! I love the colors and how you brought them out in the caption and border !!! Beautiful !!! Best of Luck to you !! Great shot and I know you already know about your text being on the line. You found a perfect illustration of literal tenacity! The composition is great, very balanced, yet dynamic. Great Photo! I wish the text wasn't running into it though. amazing picture. text is just too crowded. 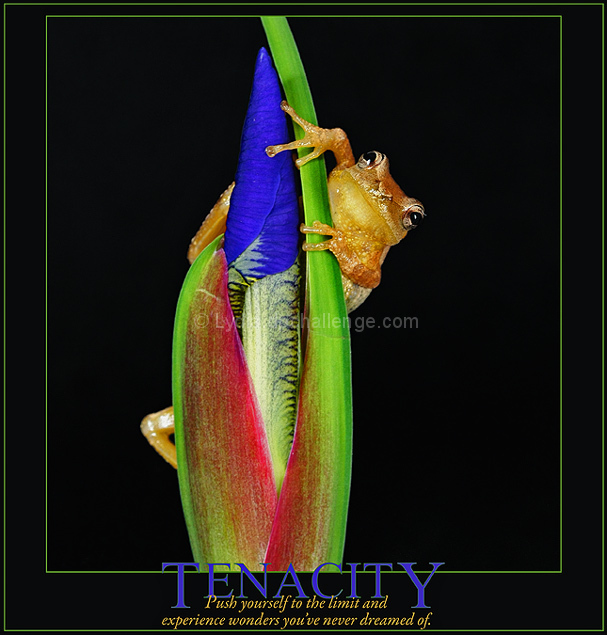 Wow, I really like the image and the tag...my only nitpick is the word "tenacity" overlapping on the border, but that's just my personal take on it. Gave it a 9. Proudly hosted by Sargasso Networks. Current Server Time: 04/18/2019 05:06:08 PM EDT.